Microblading is a semi-permanent tattooing technique that creates bolder, fuller, natural-looking eyebrows to enhance your existing brows or create eyebrows where no hair is present. Microblading at The Peer Group is performed by Kristi A. Breen, a New Jersey state-licensed technician with more than 25 years of experience in the plastic surgery and medical skincare industry. Your personalized treatment plan will include a sketch of eyebrows that suit the shape of your face so you can see what your new brows will look like. The microblading procedure takes approximately one and a half hours. This delicate and precise treatment process creates brows that can last up to two years. Touch-up appointments will be necessary to keep your brows looking bold and vibrant. We invite you to learn more about microblading with a consultation at our Florham, NJ office. "A Seamless and Amazingly Perfect Experience!! - Went to Dr. Starker at the Peer Group by recommendation of two friends who had undergone breast augmentation here. I knew by their rave reviews of the overall experience, this was a professional and efficient practice and Dr. Starker was a fantastic, kind and patient doctor - I was not disappointed. Every appointment was timely.... I never waited more than 5 minutes to be escorted into the..."
"I have been under Dr. Failey's care since the summer of 2018 after a breast cancer diagnosis and the need for reconstructive surgery. Dr. Failey, is professional, very knowledgeable, patient, calm, reassuring and kind. He is very dedicated to his work and genuinely cares about his patients and their happiness. It has been a pleasure to be under his care, as I know I am in good hands and will continue to be." "I have been using Peer Group for over 15 years because once you have experienced the best why go anywhere else? Dr Colon has a deft hand and keeps me looking “younger” than my years. Lol The office staff is warm and so helpful. And don’t even get me started on their VIP discount card, I don’t know any other offices that offer great different deals all year long and that kind of customer appreciation." "Professional yet friendly staff...Dr Starker is wonderful, I had a problem that another Dr caused, and was told by 2 doctors that nothing could be done to fix it, Dr Starker had the solution. I couldn't be happier. Thank you I will return.. you are the best!" "You will not find a more highly skilled surgeon than Dr. Colon. His expertise is second to none. He also has a very kind demeanor and is sensitive to his patients needs. The Peer Group staff is also second to none"
Microblading is a slightly different technique that is still in the tattooing family. With microblading, micropigments matching your eyebrow color are implanted into the skin by hand using a precision hand tool instead of a machine. The beauty of microblading is that the hair-like strokes are so fine and detailed that it's deemed the most realistic treatment yet. It’s also often referred to as eyebrow embroidery or microstroking. Our technician meticulously draws each hair stroke onto the skin following the direction and length of the existing hairs. Microblading can create beautiful brows that mimic a natural brow and will suit the shape of your face even if no hairs are present. 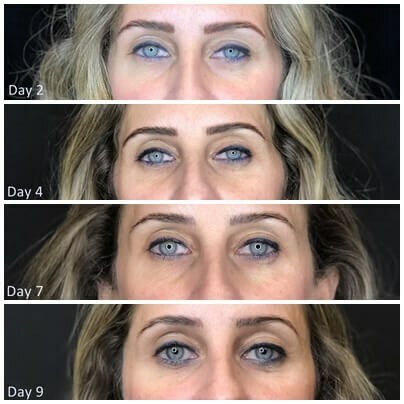 After your initial microblading treatment, a follow-up visit is recommended within three months for a touch-up application (more than one touch-up may be required for best results). The frequency of your appointments will vary depending upon several factors, which your technician will discuss with you. Your brows will appear bolder and darker than expected in the first week after treatment. This is normal. It will gradually lighten during the healing process. Be sure to follow the detailed before-and-after care instructions provided. Every patient has a different level of sensitivity to the microblading procedure. A topical anesthetic is provided to maximize comfort during treatment. Cosmetic tattoos are no more painful than a tattoo on any other part of the body. Patients should talk to the technician during the consultation about what they can expect and any pain relief they may want.